This is the story of the destruction of a talented Jewish family, and of the survival against all the odds of two young sisters. It is one of the most moving stories to emerge from the Second World War. Anita and her elder sister Renate defied death at the hands of the Gestapo and the SS over a period of two and a half years when they were sucked into the whirlpool of Nazi mass extermination, being first imprisoned as 'criminals' and then being transferred, separately, to Auschwitz, and finally to Belsen when the Russians approached. They were saved by their exceptional courage, determination and ingenuity, and by several improbable strokes of luck. 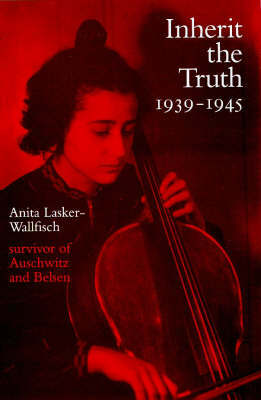 At Auschwitz, Anita escaped annihilation through her talents as a cellist when she was co-opted into the camp orchestra directed by Alma Rose, niece of Gustav Mahler. Her book is especially remarkable because of the many documents she has managed to preserve, most of them now lodged in the archives of the Imperial War Museum in London. In a sequence of family letters to her sister Marianne, who was marooned in England, from just before the war to 1942 when her parents were deported and liquidated, an atmosphere of happy normality gradually gives way to latent terror and foreboding. The appalling predicament of the Lasker family, and of Anita and Renate in particular when the rest of their relations had been deported and they were left totally alone in Breslau, could not be more poignantly conveyed. They were caught by the Gestapo trying to flee to Paris, and sent to prison: another piece of 'luck', as it turned out, since they were spared the worse horrors of Auschwitz for a crucial year. After the liberation of Belsen in April 1945, the correspondence with Marianne in England resumed. Anita was seconded to the British Army, and she quotes first-hand material about the early days of the occupation, including a transcript of part of the Luneburg trial in late 1945 when she gave evidence about Nazi atrocities at Auschwitz and Belsen, and was confronted in court by her tormentors. In 1946 she and Renate were both finally permitted to emigrate to England. Three years later, Anita became a founder member of the English Chamber Orchestra, in which she continued to play the cello until recently. Anita's book featured in BBC Radio 4's 'Desert Island Discs' programme on 25th August 1996. She had also told her story in a series of five BBC Radio 4 programmes in 1994; and a BBC 2 TV film about her experiences, Playing to Survive, was screened in October 1996. Anita Lasker-Wallfisch was brought up in Breslau, in Silesia, the daughter of a distinguished lawyer, Alfons Lasker, whose brother Edward became an American chess champion. At the age of thirteen she studied the cello with Leo Rostal in Berlin, until the 1938 Kristallnacht forced her to return home. After surviving the war, she managed to emigrate to England in 1946; and in 1949 she became a founder member of the English Chamber Orchestra, with which she still plays. She married Peter Wallfisch, the pianist, and has two children, Maya and Rafael, who is also a celebrated cellist.